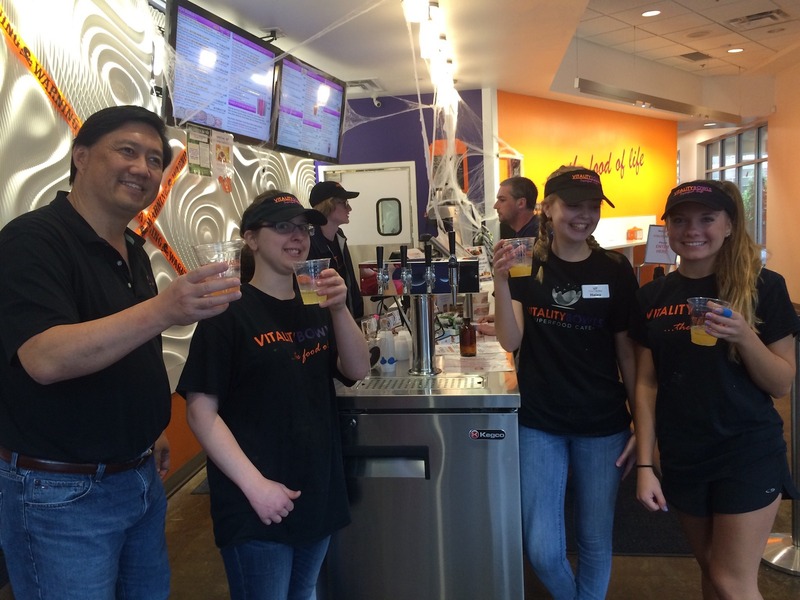 Vitality Bowls Carmel Indiana opened in February 2015 in the Carmel Arts and Design District. Carmel is a suburban city in Hamilton County Indiana. Vitality Bowls Carmel is located in the Design District, a thriving area featuring a number art galleries, boutiques and restaurants. Customers love to warm up with Vitality Bowls’ hot soups and Panini made with all natural, grass fed meats during cold Indiana winters. Superfood acai bowls, salads, smoothies and fresh juice are also popular. One of the local favorites is the Breakfast Bowl, made from a blend of Organic Açaí, Nonfat Milk, Apple Juice, Bananas, Strawberries and Flax Seed; topped with Organic Granola, Bananas, Strawberries, and Honey. 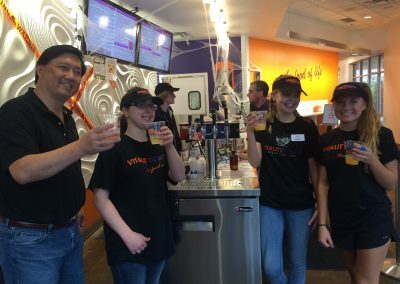 Dave and Irene Tang, owners of Vitality Bowls Carmel, have always been health conscious. Irene, who was previously an elementary school teacher, runs a number of marathons each year. Dave, a real estate developer, knew Carmel would be the perfect place for such a healthy concept. “I had never been to Vitality Bowls until this morning and all I have to say after my first visit is that I wish I lived in closer proximity to one. I had the Warrior Bowl and it was to die for. The smoothie bowls are organic and everything is made fresh to order. They contain no frozen yogurt, no added sugars or artificial preservatives; they are natural ingredients and very fresh fruit. Not only was the bowl itself amazing, but the service was great too! “The only stipulation I would say is the price, it is a bit pricey with a medium bowl at $11.25. Countering that, it is a 20oz. bowl so it is like a meal and fills you up and you’re paying for the fresh ingredients and antioxidants within those. “Bowls, Paninis, Smoothies, oh my! “Cute lil place off Main Street in the Carmel Arts & Design District! Staff is very welcoming and they enjoy telling you about the ingredients they use. Everything is made to order so allow some time when you visit as you will have a short wait as they create your menu selection. Some of the items I had never even heard of, so you might even learn something while you’re there! I also appreciated being able to substitute a few things and take some things off their extensive list of smoothie concoctions to find the perfect fit for what I wanted that day. – Tara Q. Noblesville, IN.